The latest piece of equipment to support hospital staff and patients in the fight against cancer has been officially unveiled at Castle Hill Hospital today. Some months ago, the Chief Executive of NHS England, Simon Stevens, announced a special fund to modernise radiotherapy equipment across the country. 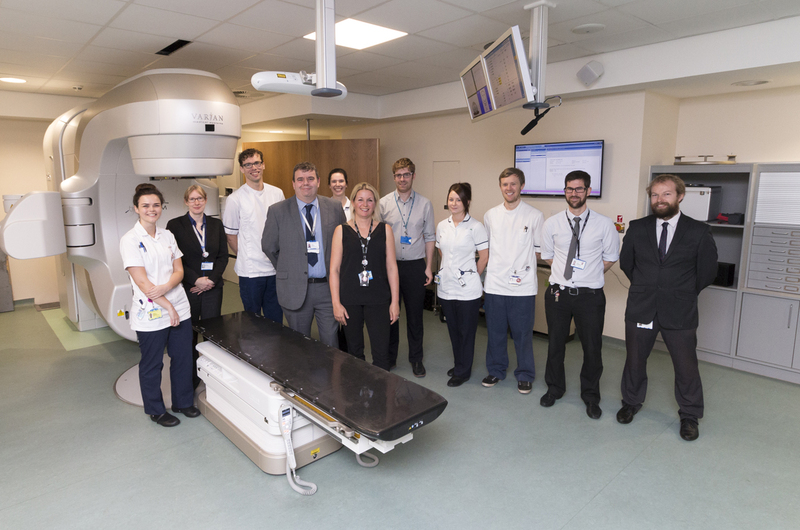 Hull University Teaching Hospitals NHS Trust was lucky enough to receive a share of the funding, and the Queen’s Centre took delivery of a new Varian Truebeam Linear Accelerator (Linac) in the summer. Valued at an impressive £1.7m and following an installation and commissioning period, the Linac has received its official unveiling today, attended by staff and patients who will use it in the weeks and months ahead. “As a specialist cancer centre for the region, we treat patients from as far afield as Scarborough, York and Grimsby. Around four in every ten patients who experience cancer receive radiotherapy treatment as part of their cancer pathway. Around 230 new patients per month are referred for radiotherapy, and approximately 110 patients per day from across Hull, East Yorkshire, North Yorkshire and North East Lincolnshire travel to Cottingham to receive treatment in one of the Queen’s Centre’s six treatment units. Using the Linac, staff will be able to treat patients with some of the very latest techniques, including SABR (Stereotactic Ablative Radiotherapy), a very short course of high dose radiotherapy treatment which is used to target small tumours in the lung. “In our department, we pride ourselves on being at the forefront of cancer treatment, and the new Linac enables us to extend the availability of the very latest techniques and technologies to more of our patient treatments. Not only does this mean radiotherapy treatment is more accurate, but in certain patient groups, the technology allows us to more carefully monitor patients’ treatments and enables us to assess and make modifications to treatment. This has the potential to reduce side effects and increase the effectiveness of the treatment we are delivering. Radiotherapy can be delivered internally, using a technique called Brachytherapy, and externally, using a Linear Accelerator. The treatment is carefully planned using a CT scan to allow the Clinical Oncologists to pinpoint where they wish the Dosimetrists and Physicists to create a treatment plan. The treatment plan then provides the instructions for the Therapy Radiographers to deliver the treatment. The aim is to target the cancer while keeping the dose of radiotherapy to the surrounding healthy body tissue to a minimum. The detailed planning and treatment delivery ensures that the treatment is delivered to the exact place each day. Patients may experience some side effects, such as fatigue, nausea and skin reactions, however this varies depending on which part of the body is receiving treatment. If patients do experience side effects, there is a patient support team including Radiotherapy Nurses, Clinical Support Workers and Therapy Radiographers available to help. The new Linac machine was officially unveiled this morning by Trust Chief Executive, Chris Long, and Chairman, Terry Moran. The Trust is now looking forward to receiving its second Truebeam Linac courtesy of the Radiotherapy Modernisation Fund. This will arrive in December 2017 and be operational by March 2018.